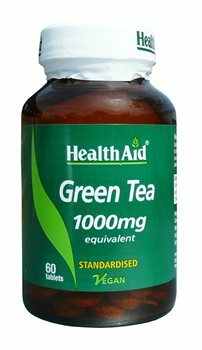 HealthAid Green Tea tablets are formulated using the best quality tea extracts, rich in catechins polyphenols. The active constituents make green tea a powerful natural anti-oxidant, to help maintain all round health. di-Calcium Phosphate, Green Tea Extract (Camellia sinensis), Microcrystalline Cellulose, Veg. Stearic Acid, Veg. Magnesium Stearate, Coating: Hydroxy Propyl Methyl Cellulose (HPMC). Adults and children over 12 years, one to two tablets daily. Do not exceed recommended daily intake unless advised by a suitably qualified person.